The Food Stylist’s Handbook is a “must have” book for every aspiring food stylist, and food photographer. This is a review of The Food Stylist’s Handbook, by Denise Vivaldo. Even though I’m a food photographer and not a food stylist, I found this book very interesting and quite informative. I’ve been around more than a few different food stylists over the years, and I’ve always found it to be fascinating, how different stylists attack the same problem in different ways. Food Photographers probably have this in common with them. I think the reason for this is that we are all in our own little bubbles, and afraid to share the tricks of the trade with our competitors. I know I’m guilty of this, so it’s nice to see someone willing to share and teach the next generation. Denise, you did a great job. As you can imagine, this book is full of some amazingly beautiful food photography and some great behind the scenes photos too. I can only ponder the hours she took to write and assemble all this information and great content. The book spends a lot of pages talking about the career of food styling, including a brief history, FAQs, the traits of a good food stylist, the importance of a culinary background, who the clients are, and how to get started in the career. AND that’s only the first chapter! This book is a treasure trove of information for the aspiring food stylist, and would be a great textbook of any future course taught about the subject of food styling. 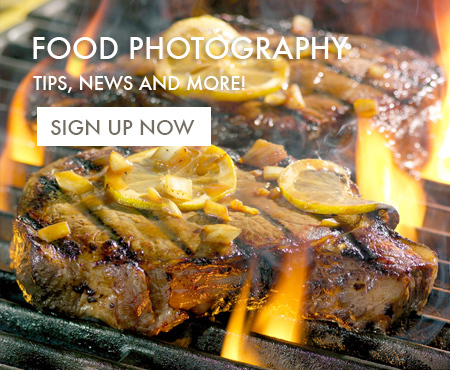 That’s all well and good, but as food photographers, what’s in it for us, you might ask…? After all, why would a food photographer want to buy a book about food styling? 1. First off, it’s kind of interesting to see the behind-the-scenes photos from so many different food photography studios. In my career, I’ve only seen one, and that one is mine. So it’s nice to at least get a glimpse at other studios. And the food photos are inspiring too. They’re definitely fist class, and I’m going to have look in the credits of the book to see who I should add to my “100 Best Food Photographers” list. 2. A little while back, I assembled my own little food styling kit to take on location, as sort of a “just in case” collection of useful tools for when I was forced to do a little styling on my own. Boy, what a good idea that was! I’ve used it several times and have even loaned it to one of my regular stylists when she discovered that she had inadvertently left her kit at home one day. I would highly recommend that if you are a food photographer, that you put together a similar kit, and what should you put in that kit? Well, Denise goes into great detail about what’s in her kit. Your kit doesn’t have to be as extravagant, but her kit is a really great source for ideas of the items that you might want to include in your own kit. If you’re a beginning stylist and you don’t have this book, you’re CRAZY! And if you’re a photographer, you probably should get this book too, because you never know when you’ll have a shoot where the stylist is struggling a little. If she (or he) is, and you might be able to “tactfully” make a suggestion or two that can save the day. If nothing else, you’ll be able to talk a little shop with new stylists and with clients so that they actually think you know what you’re doing, even if you don’t. If you already own this book, I’d be really interested in knowing what you think about it. Did you learn anything? Is there a better book out there on the same subject? Please give me your opinion in the comment section, down below this post. Thank you for taking the time to read my blog. If you have any comments, suggestions, of even questions that I can answer in future food photography blog post, please leave them in the comment field below and please use the buttons below to share this post with anyone that you think might be able to benefit from reading this great resource on the career and art of food styling. And if anyone else out there has a book that you’d like to me review, please send it to me and I’ll do my best to give you an honest opinion. You can find my address in the contact link. Hey Michael – I was thrilled to see your review of Denise Vivaldo’s book, The Food Stylist’s Handbook. I have worked on and off with Denise for over 10 years. In fact, she actually helped me launch my career as a food stylist and culinary producer. To say that Denise is generous with her wealth of knowledge and experience is, at the very least, an understatement. 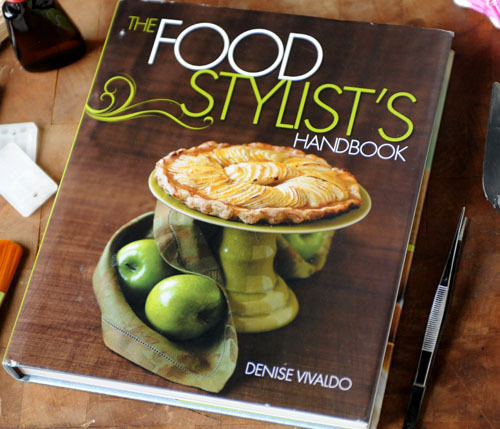 Unlike most food styling books that only give tips and tricks, Denise instructs the reader on all of that, but more importantly, on how to run a business and be a SUCCESSFUL food stylist. Freelance food styling is a tough gig at best (and contrary to what some believe, it is far from glamorous). Denise gives imparts the necessary tools to succeed. I could go on and on as I have nothing but complete admiration and respect for Denise, for what she has taught me, and for the generosity of her knowledge and spirit. This book is a must have for any food stylist, food photographer, and even prop stylists who works with food. We have this book as well. Serves as our “bible” for food styling and photography. Great book.